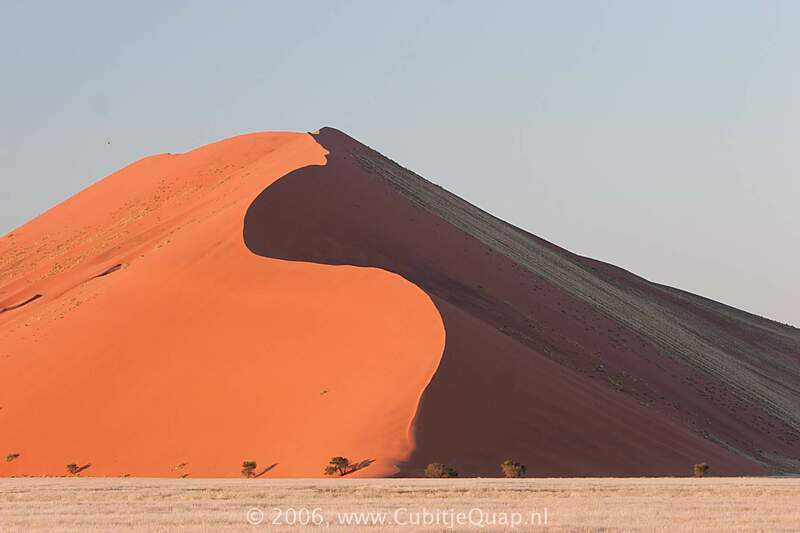 Sandwiched between two deserts - the Namib in the west and the Kalahari in the east - Namibia's arid southern region offers breathtaking landscapes. 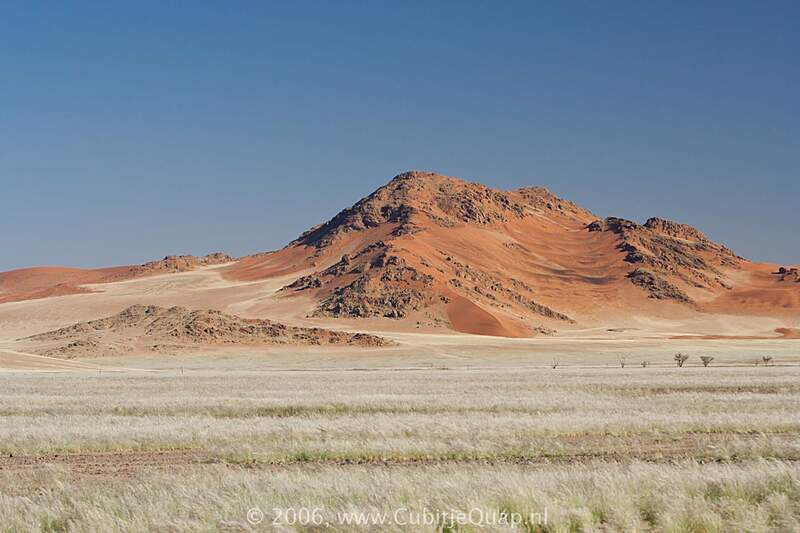 The Namib-Naukluft Park is Namibia's most versatile conservation area. 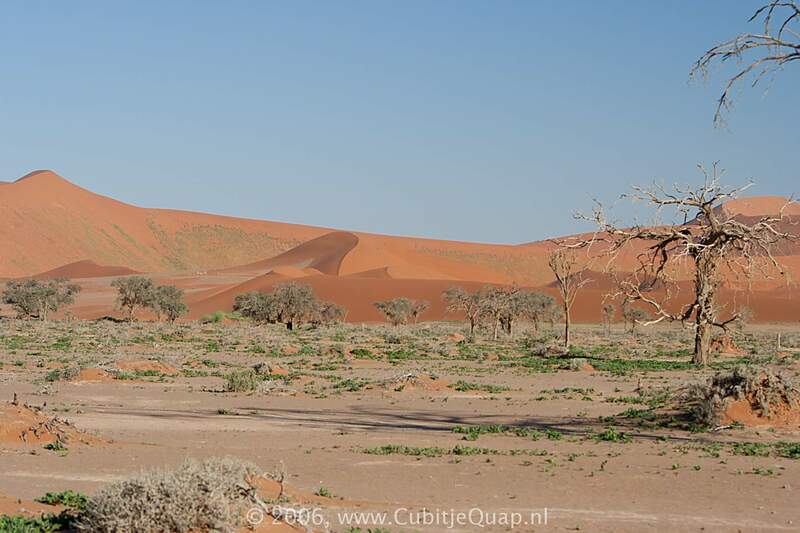 The vast wilderness of almost 50 000 km² contains key features such as Sossusvlei, Sesriem, the Welwitschia Trail, Sandwich Harbour, the Naukluft Mountains and the Kuiseb Canyon. 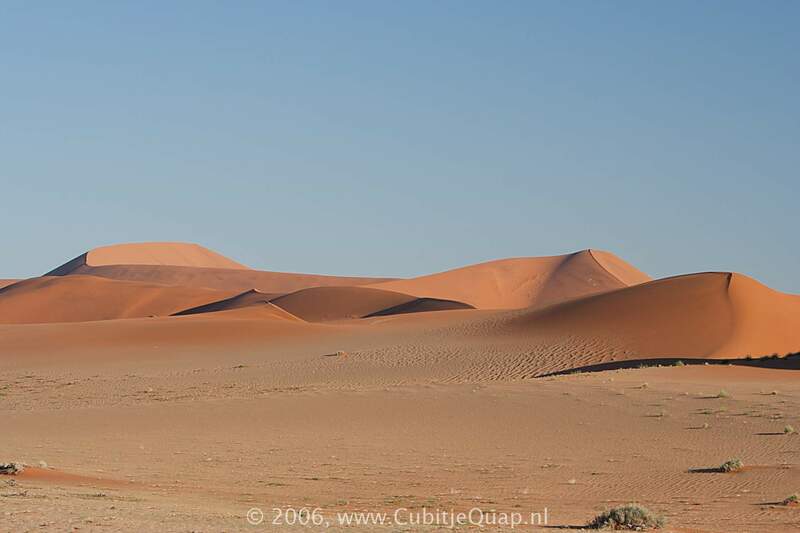 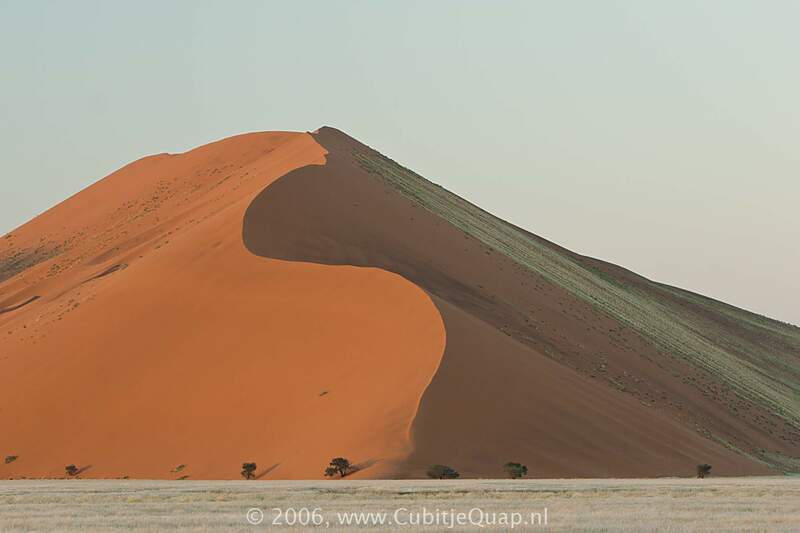 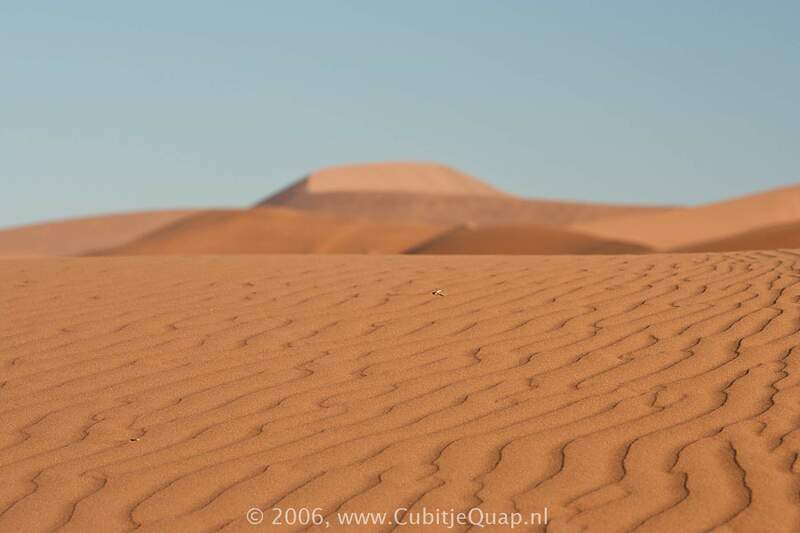 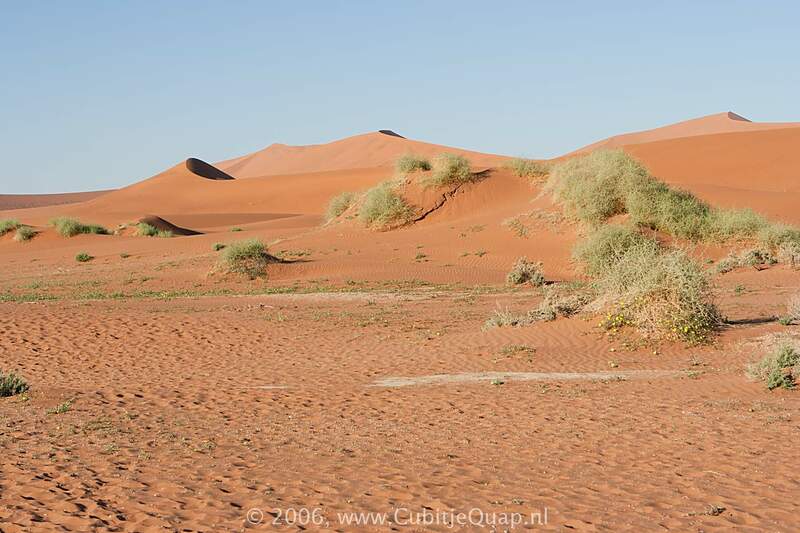 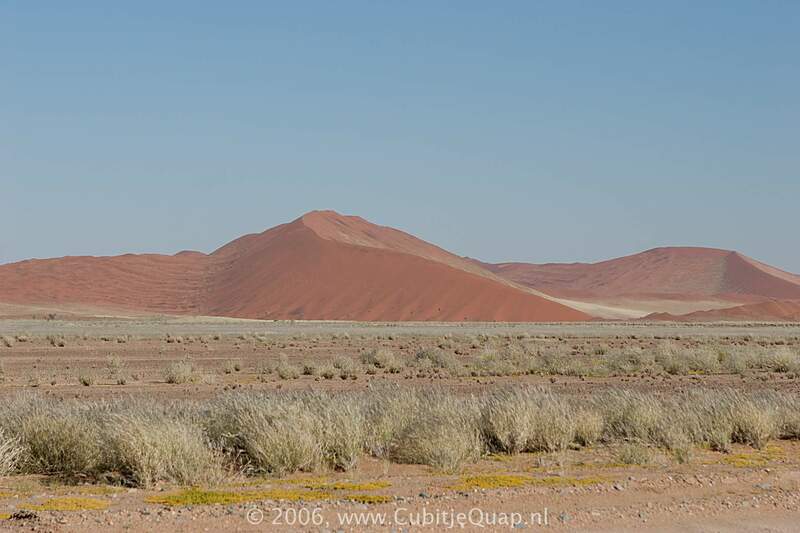 This vast tract of land consists of dunes (some of which at Sossusvlei are amongst the highest in the world), gravel plains and rugged mountainous. 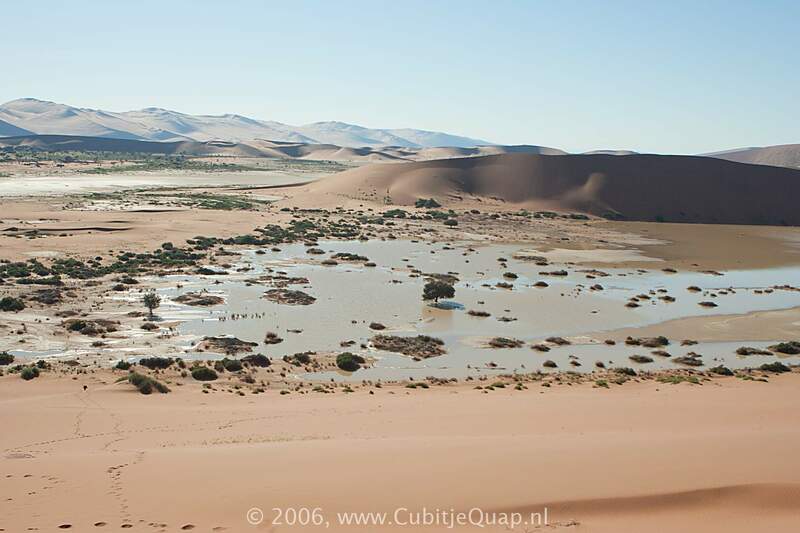 Sesriem and Sossusvlei lie on the Tsauchab River, one of two large rivers (the other being the Tsondab, further north) which flow westward into the great dune-field of the central Namib, but never reach the ocean. 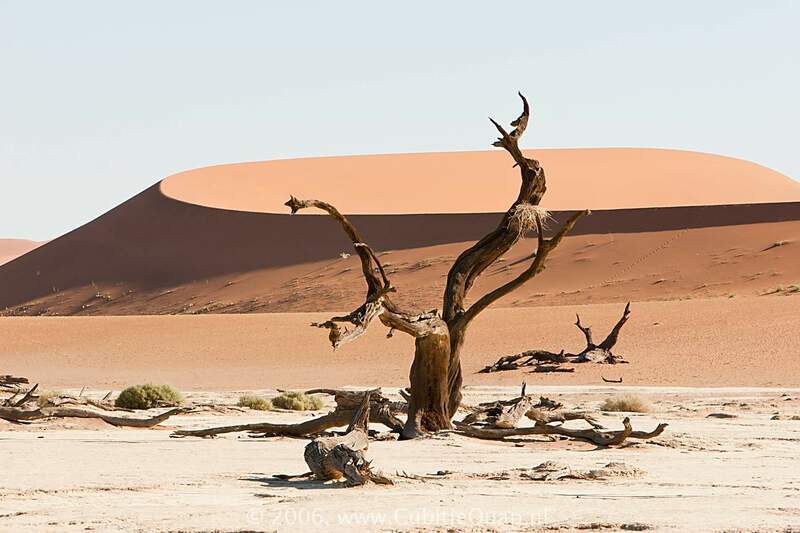 Both end by forming flat white pans dotted with green trees, surrounded by spectacular dunes – islands of life within a sea of sand. 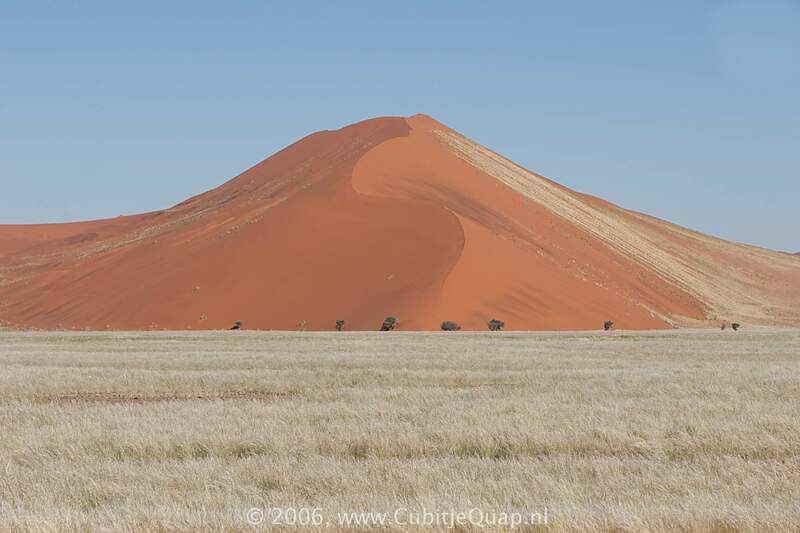 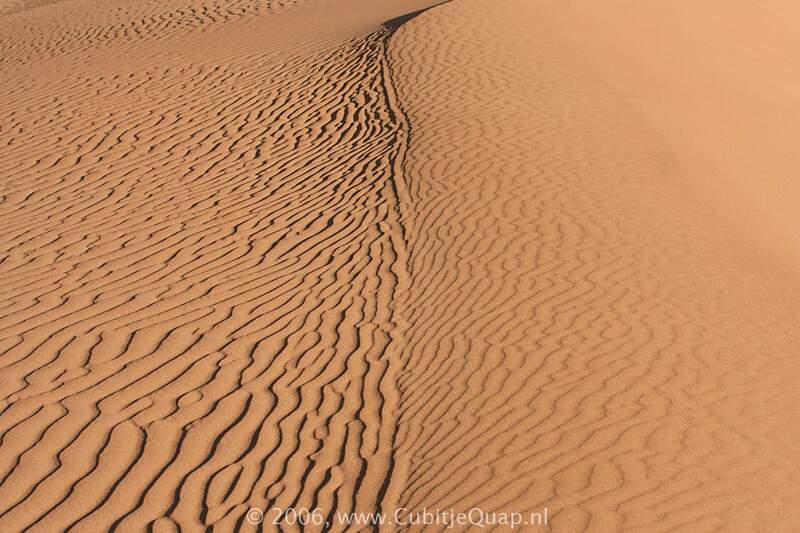 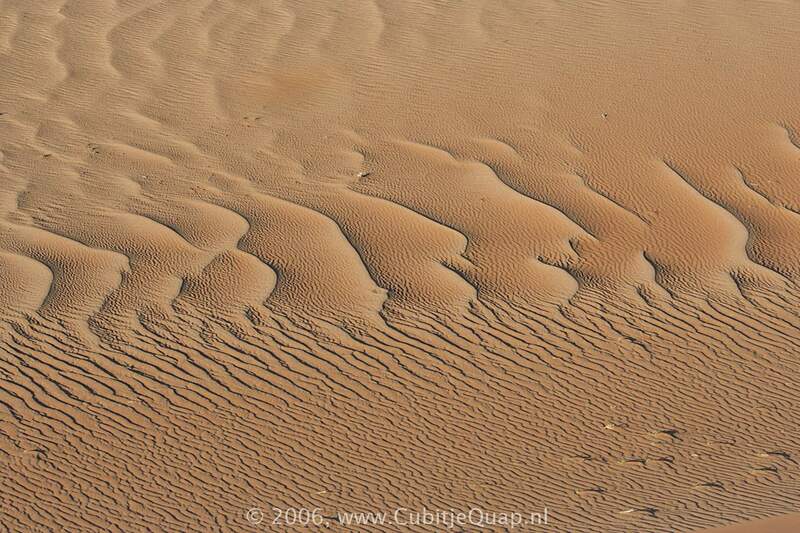 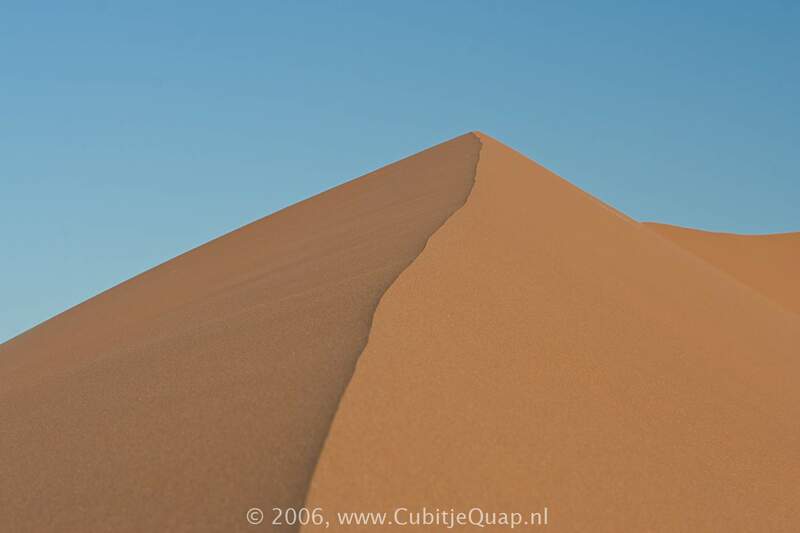 The dunes of the Namib desert have developed over a period of many millions of years. 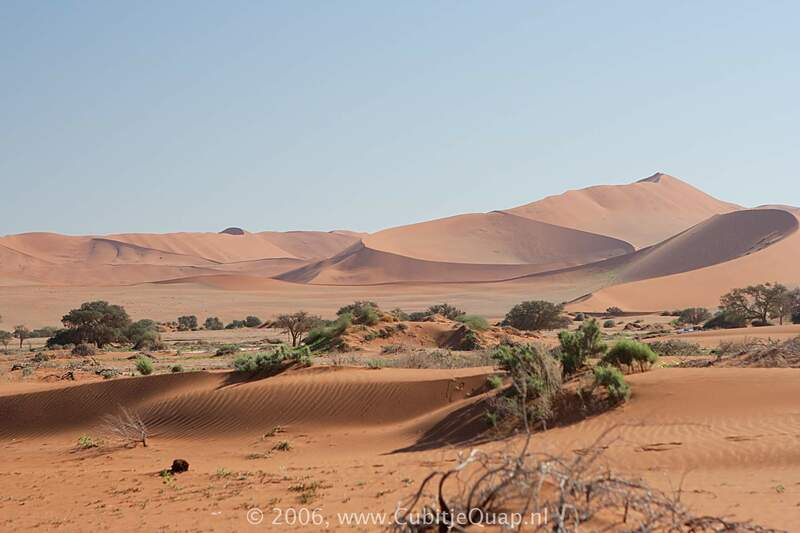 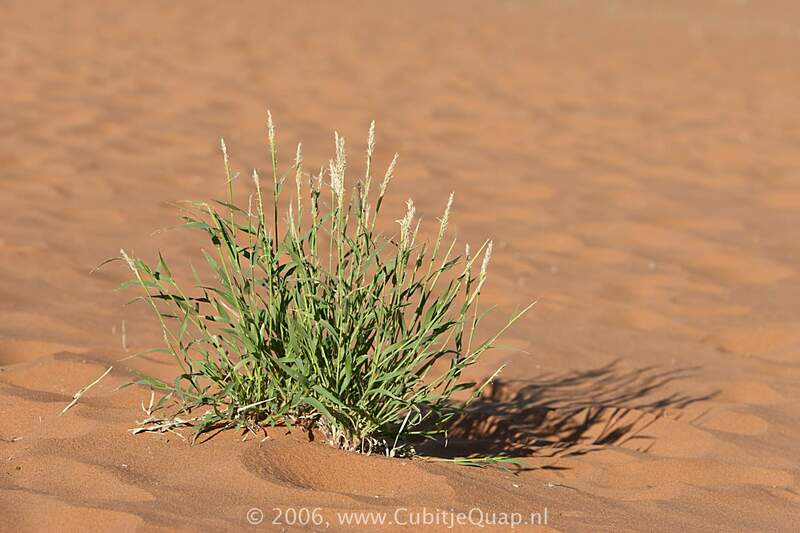 It is thought that the vast quantities of sand were deposited into the Alantic Ocean by the Orange river. 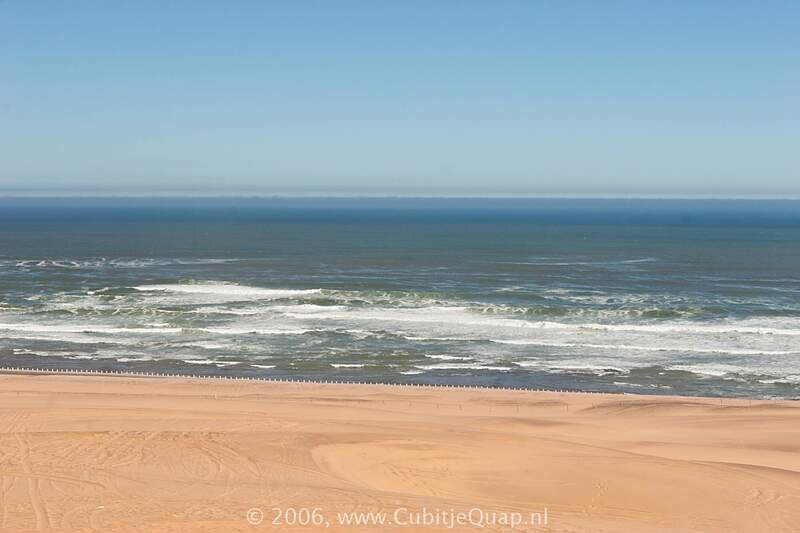 This material was subsequently moved northwards by the Benguela current to be dumped back onto the land by the surf. 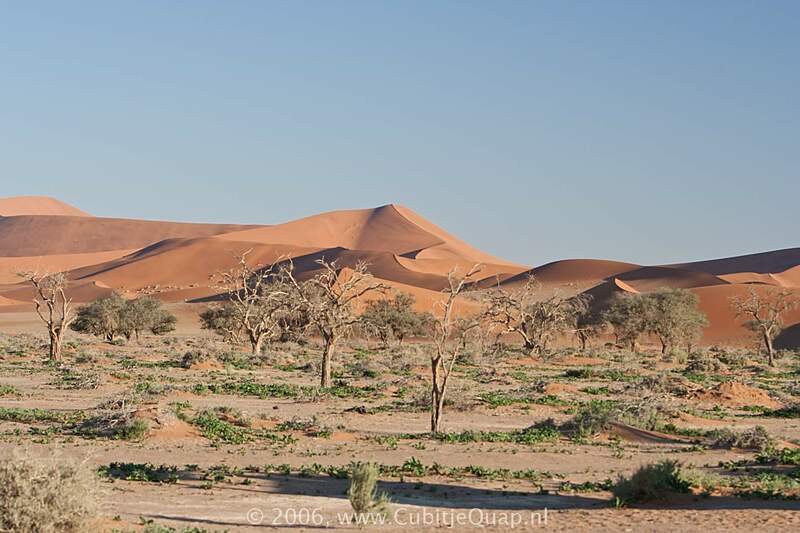 The road runs southwest past Sesriem. 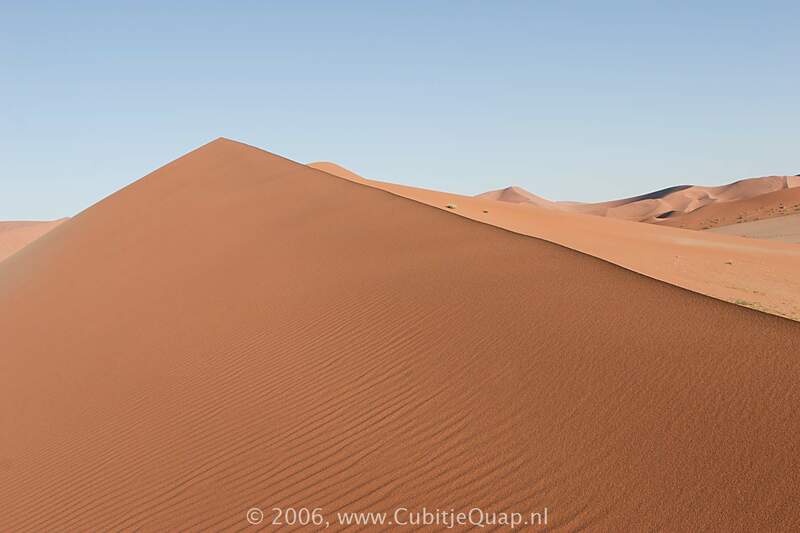 It is soon confined into a corridor, huge dunes on either side. 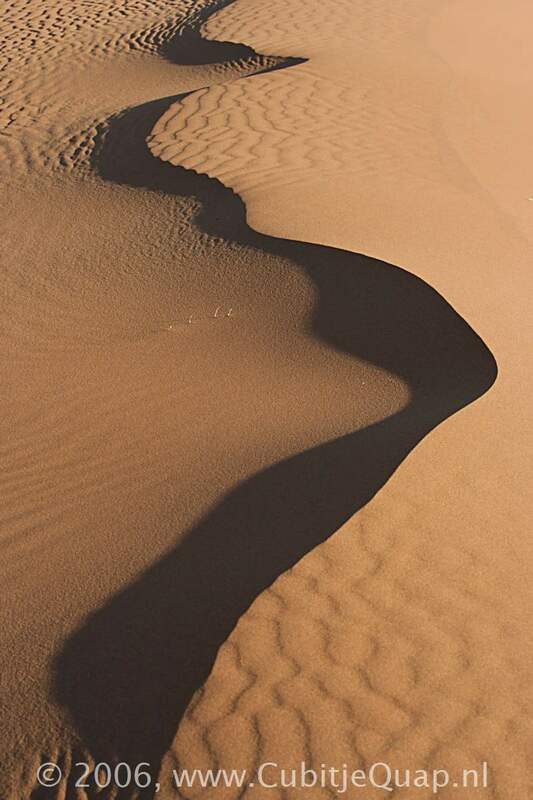 Gradually, this narrows, becoming a few kilometres wide. 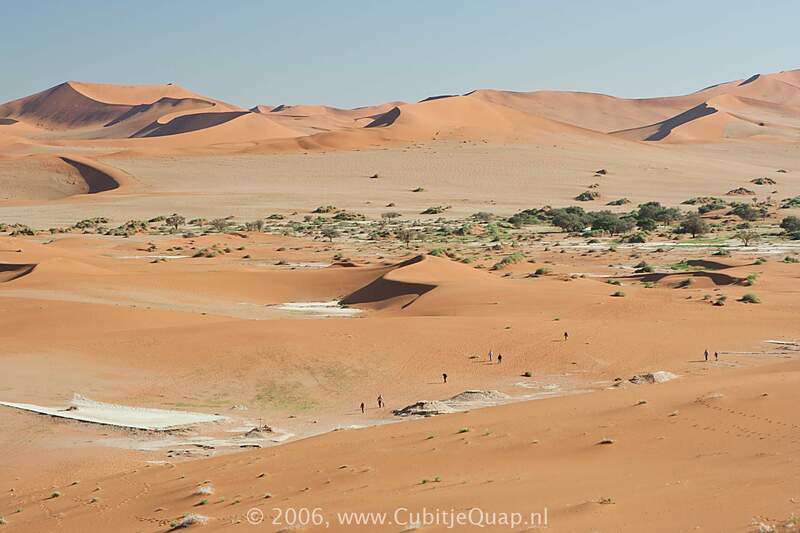 This unique parting of the southern Namib's great sand-sea has probably been maintained over the millennia by the action of the Tsauchab River and the wind. 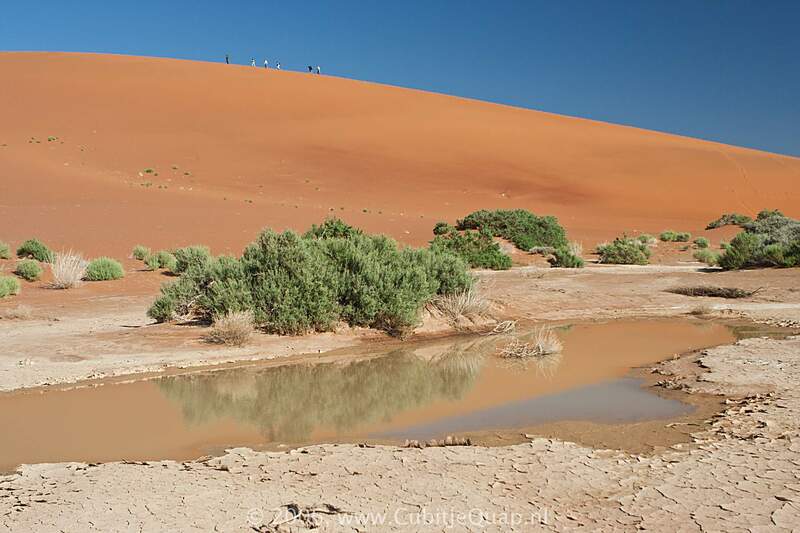 About 24km after leaving Sesriem, the road crosses the Tsauchab River. 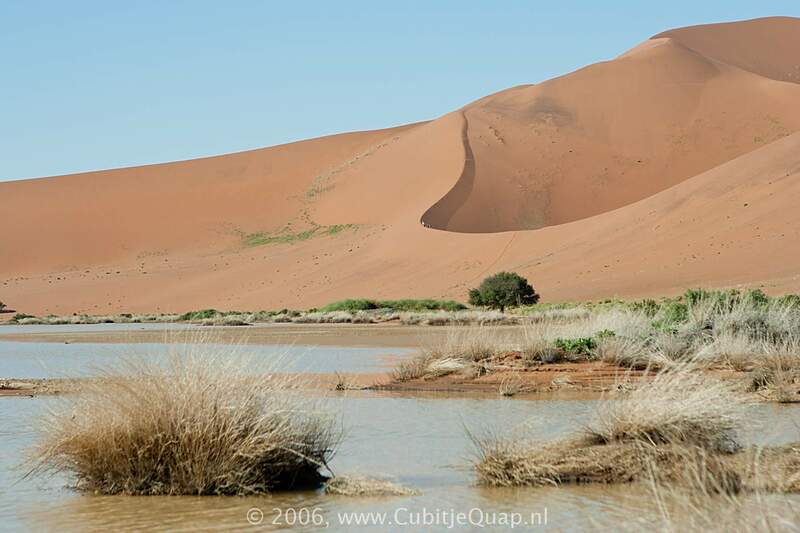 Although this river seldom flows, the green camelthorn which thrives here, clearly indicates permanent underground water. 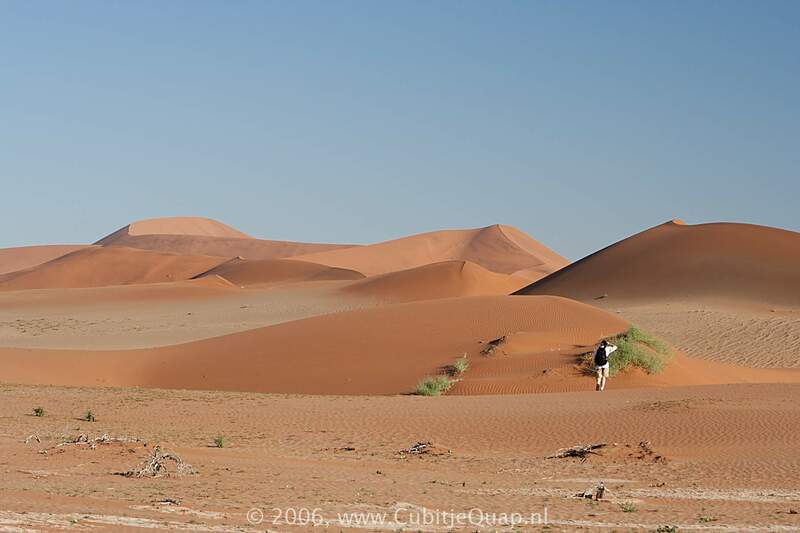 Continuing westwards, the present course of the river is easy to spot parallel with the road. 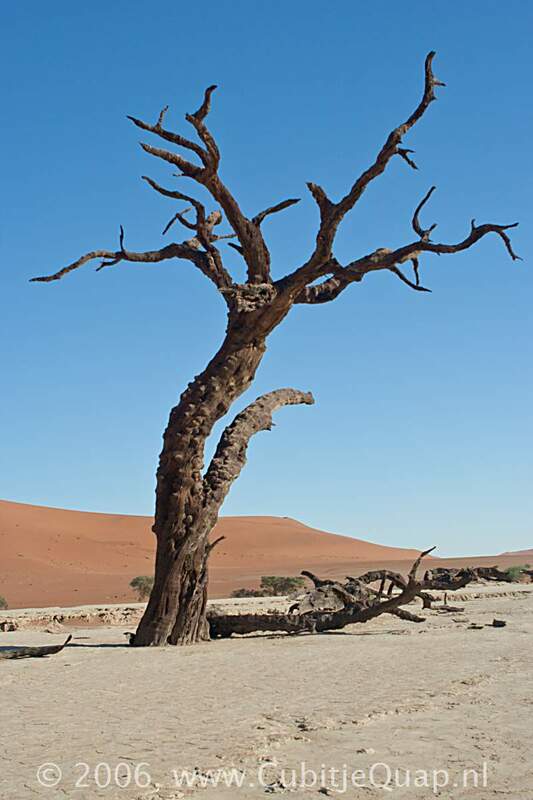 There are many dead acacia trees that mark old courses of the river, now dried up. 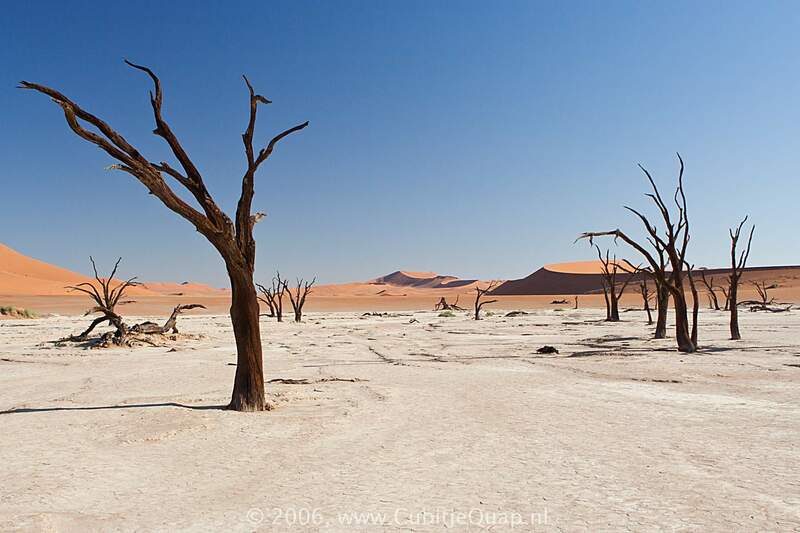 Some of these have been dated at over 500 years old. 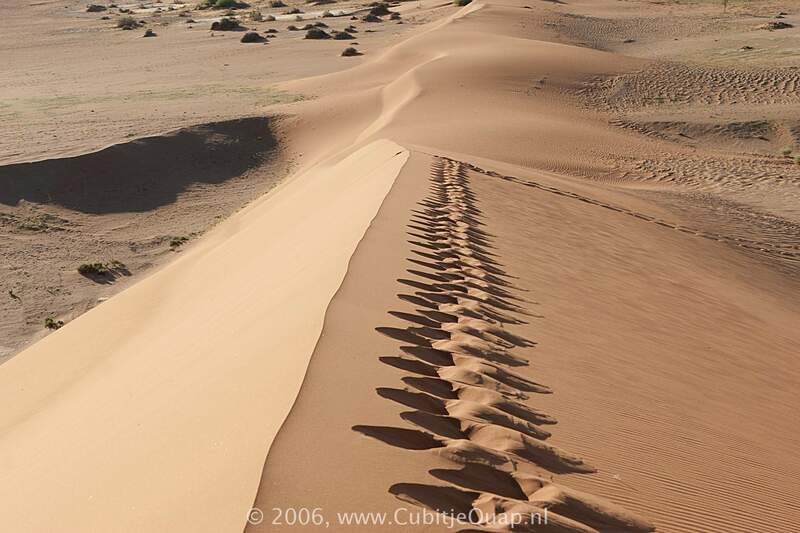 Along the final stretch of road are a few side-tracks leading to the feet of some of the dunes, numbered according to their distance along the road from the office. 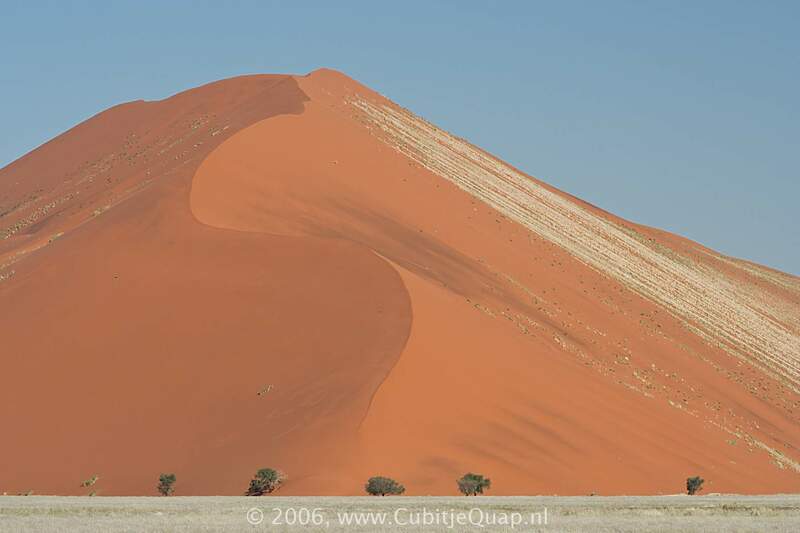 Dune 45, on the south side, is particularly photogenic. 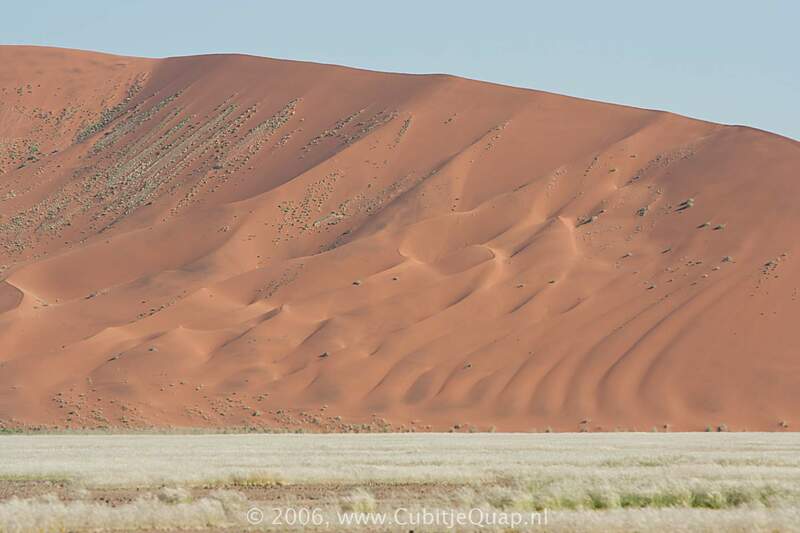 About 36km after crossing the Tsauchab, the road ends at the 2WD parking area. 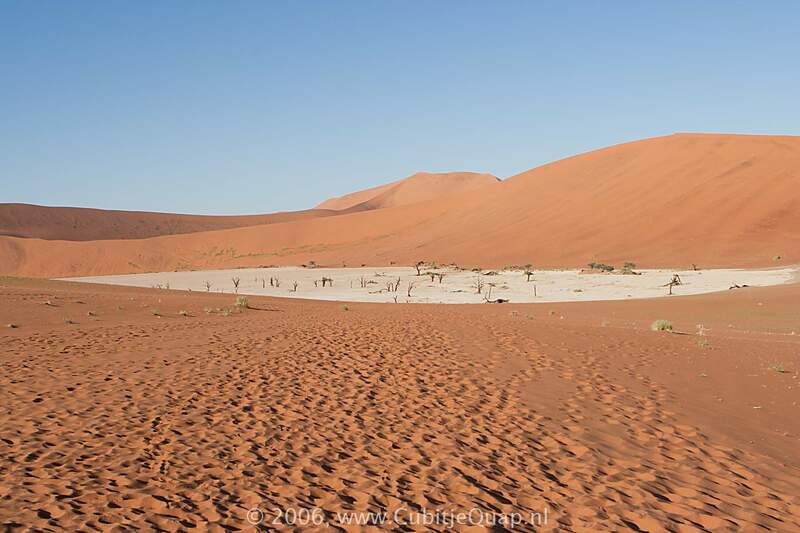 The tarred road from Sesriem to Sossusvlei ends at the 2WD parking area. 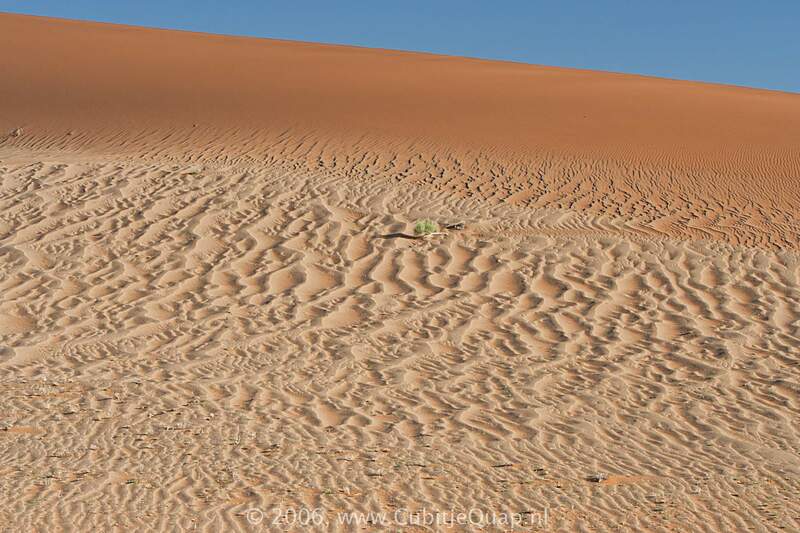 From that point a sand track leads to the 4WD car park 5 km further. 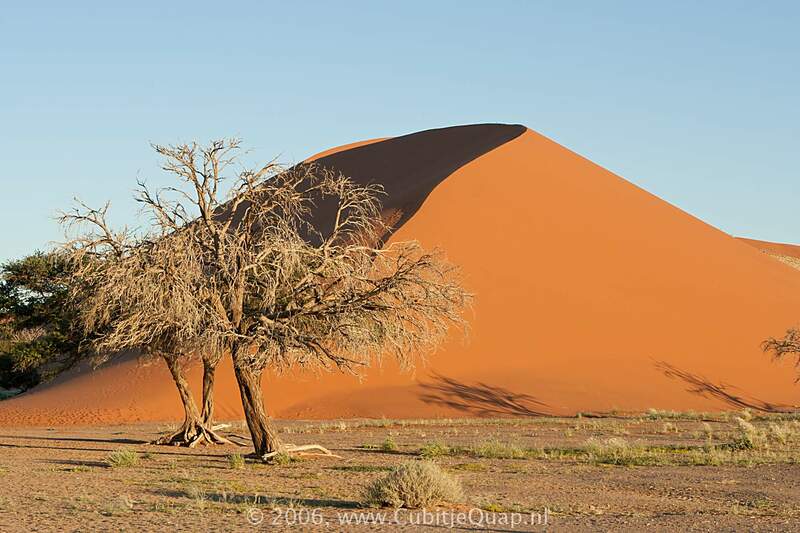 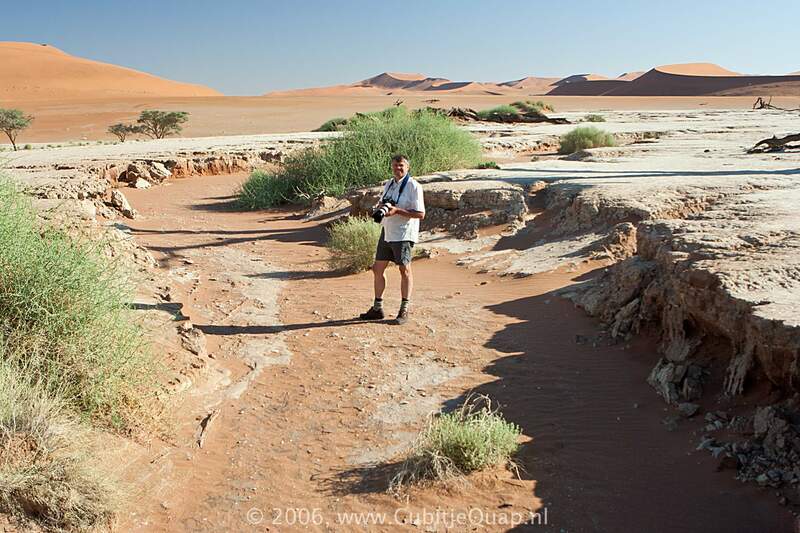 From there it is a short walk to dead vlei, named after the skeletal remains of the Camelthorn found in the pan. 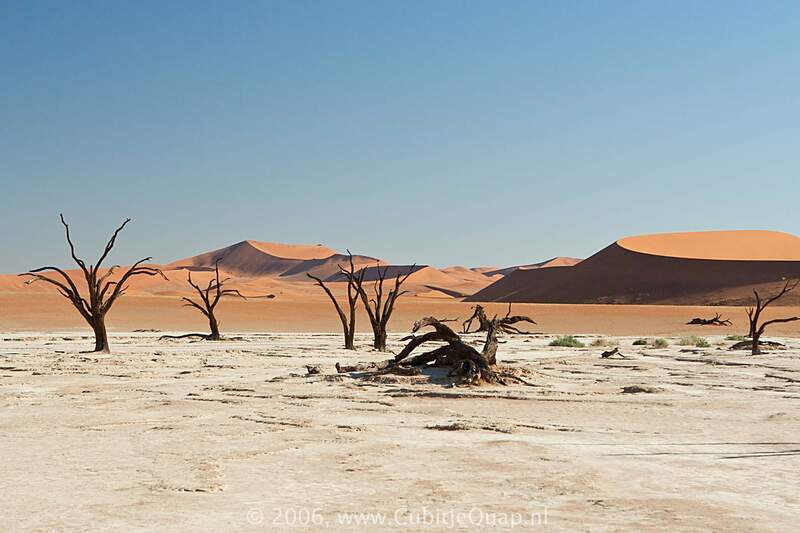 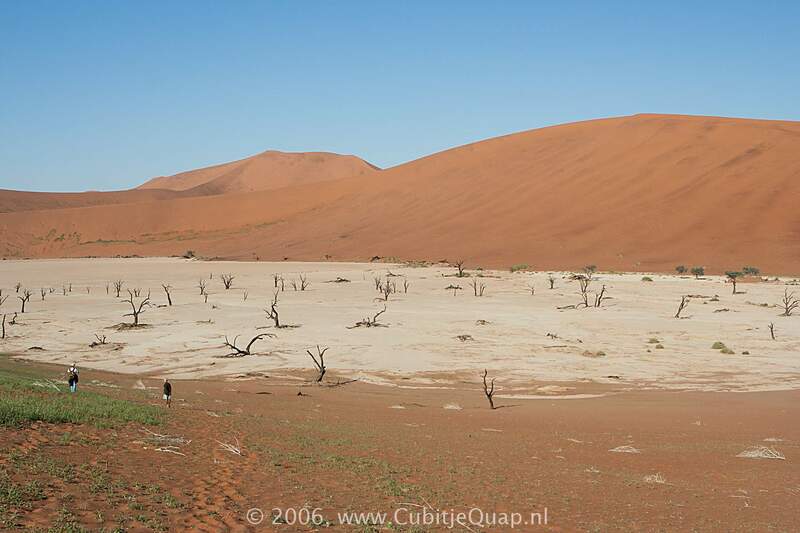 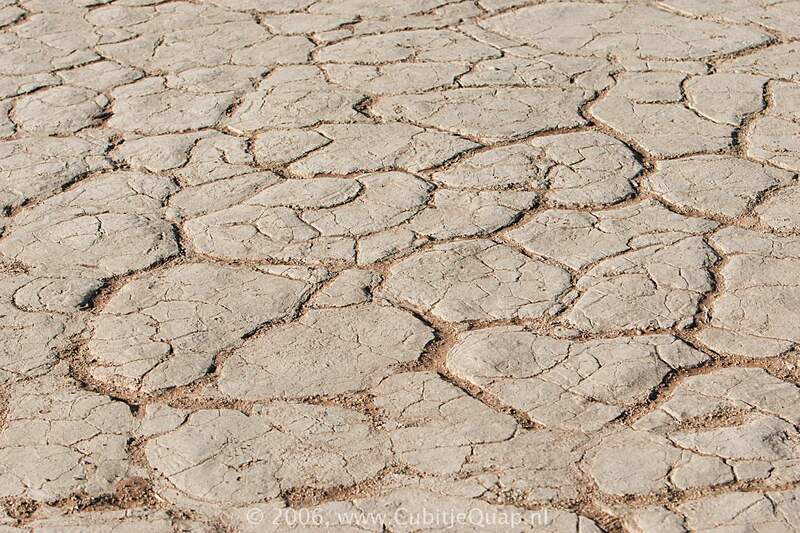 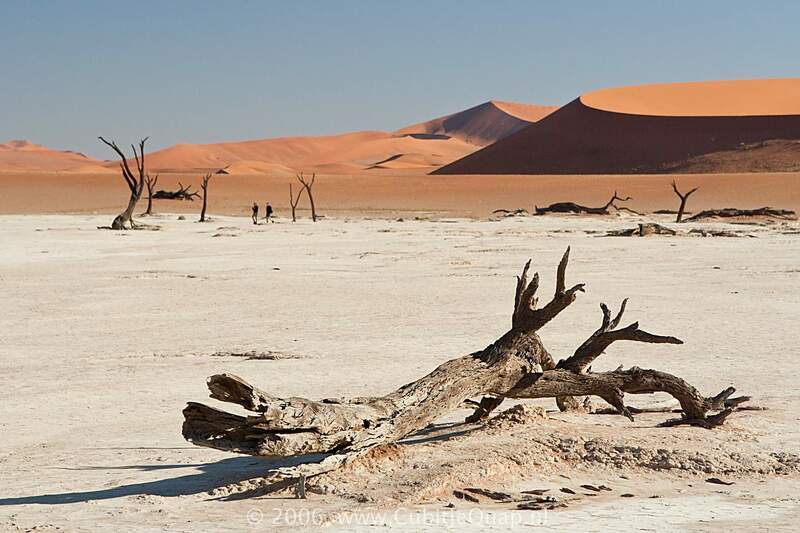 The clay pan of dead vlei was formed after rainfall, when the Tsauchab river flooded, creating temporary shallow pools where the abundance of water allowed camel thorn trees to grow. 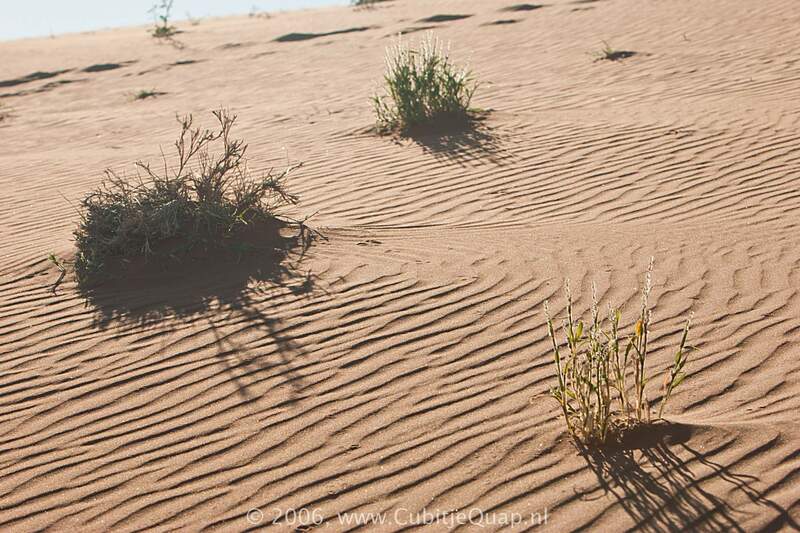 When the climate changed, drought hit the area, and sand dunes encroached on the pan, which blocked the river from the area. 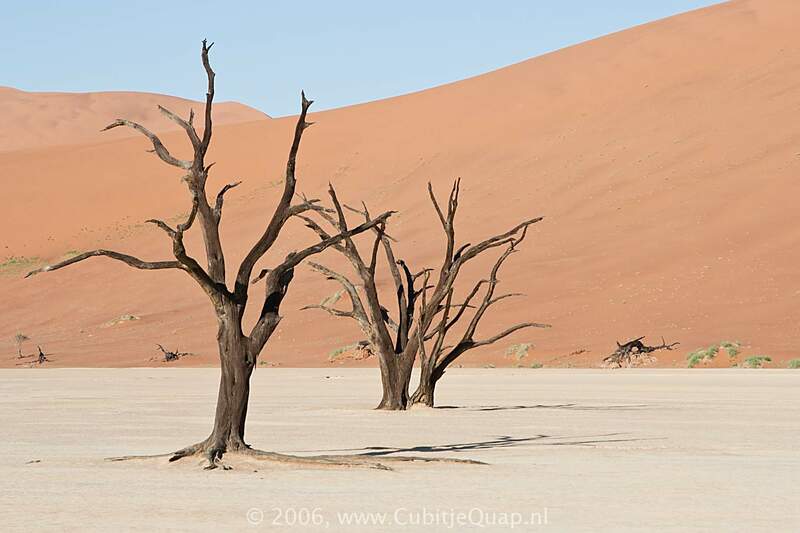 The trees died, as there no longer was enough water to survive.